Generally, teething begins when babies are around 6 to 10 months old. However, some babies start to have their teeth earlier or later. This is determined by hereditary factors, and varies between different people. If your baby still hasn't got his/her first tooth when he/she is 1 year old, you could bring him/her to the dentist for a check-up. Wipe your child's mouth frequently to keep his/her mouth clean and dry. Gum irritation is common during tooth eruption. To relieve the discomfort, your child may like to chew a cool object. You can let your child chew on a liquid-filled teething ring, which should be cleaned and chilled, to reduce the irritation. 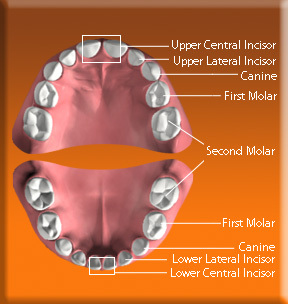 Swollen gum is normal during tooth eruption and the swollen part is usually firm. However, it is not normal if the swollen gum turns red or blue. In such case, parents must bring their children to see the dentist. Babies are easily irritated during tooth eruption. Parents should spend more time with their children. Playing games with them can distract them from the irritation. Tooth eruption will not cause fever. The baby may pick up anything to chew during teething that may increase his chance of getting an infection. If your child has symptoms like fever, runny nose and diarrhea, you should take your child to see a doctor immediately.